On Thursday, South Korea’s esteemed high school seniors took their college entrance exams. 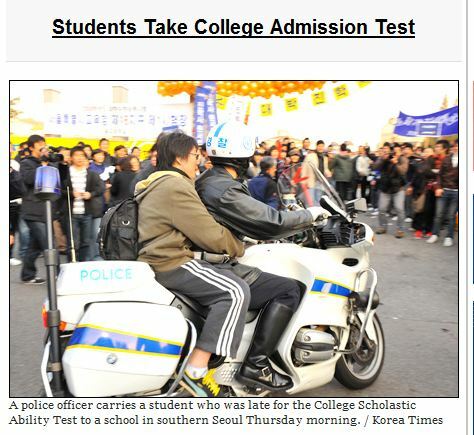 These exams — think, SATs — are the single most important test a South Korean will take in his or her life. Accordingly, the rest of Korea changes their time schedule once a year for high school students. Due to the possible traffic conflicts, most employers give their workers an extra hour or so to sleep in on this day. (Some parents even get the whole day off so they can pray in front of the test site.) Even the military was told to not conduct any noisy activities during the test. The only people (besides high school students) up early were Korea’s public safety officers. Nearly all of them come out to help direct traffic and give rides (by car or motorcycle) to high school seniors running late to their test! Eat Your Kimchi has a great video about this year’s national exam day here. Thanks for the link, Alex 😀 Glad you like our video. Next post Don’t taze me, hyeong!